Have you ever tried stuffing peppers with noodles/vermicelli. Here it is. Thin noodles stuffed peppers can be served as an appetizer or a meal. Here I used thin wheat noodles, which is similar to vermicelli/semiya but thinner than semiya. So any kind of noodles can be used and veggies can be included for variation. Mango noodles is the blend of mango rice and noodles/vermicelli recipe. Adding mango to noodles gives sweet and tangy taste with the mango flavour. Enjoy this stuffed peppers with any salad/ sauce. Pre-heat the oven at 200deg C, line the baking tray and grease and keep aside. Cut the peppers to half and remove all the seeds and place them on a greased baking sheet. Bake them in the oven for about 10-12minutes/until they are soft and slightly roasted. Drain the softened noodles in a colander and allow them to cool a bit . Heat oil in a saucepan add onions saute for 1-2minutes. Add in chilli paste, turmeric with 2-3tbsp of water mix well and saute for 1-2minutes. Add grated mango, salt mix well and fry for 3-4minutes more. Then add cooked noodles, crushed peanuts mix well until well combined and reduce the flame to low cover and let it sit for 2-3minutes. Turn off the flame and allow it to cool a bit. Stuff the roasted peppers with the noodle stuffing, sprinkle some mozzarella cheese, olives and place them on the baking tray and bake again for 6-8minutes/ until the cheese melts. Remove from oven drizzle some lemon juice/ sauce and enjoy. 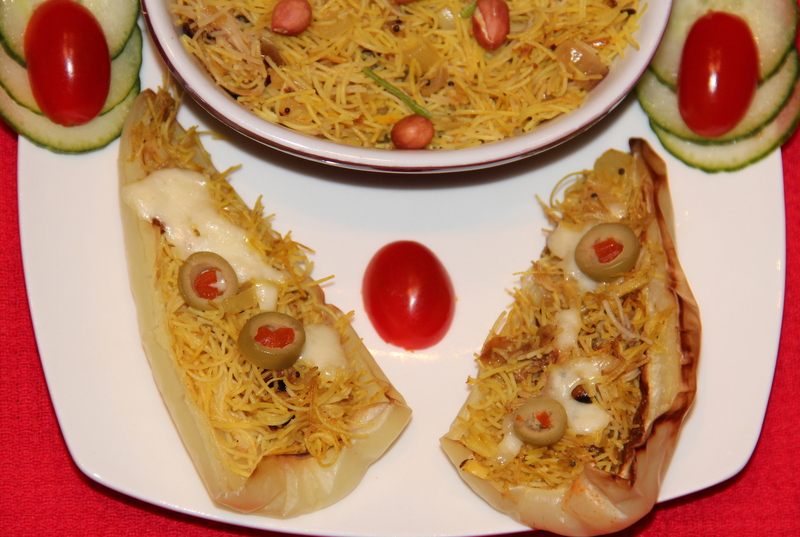 Vermicelli/semiya can also be used alternatively. Oil and cheese quantity can be increased as per the taste. Mango I used hereis a blend of sweet and sour so if its full raw green and tangy reduce the quantity or use accordingly. Posted on September 14, 2014, in Appetizers, Indian, International, Starters. Bookmark the permalink. 22 Comments. I love that mango is a part of the ingredients. I’ve never made anything like this, but it looks wonderful! Quite a novel idea :). Greetings Chitra, Lovely idea! Regards, Cheryl. Mmmm that looks delish! Vermicilli is one of my favorites, this preparation sounds wonderful!